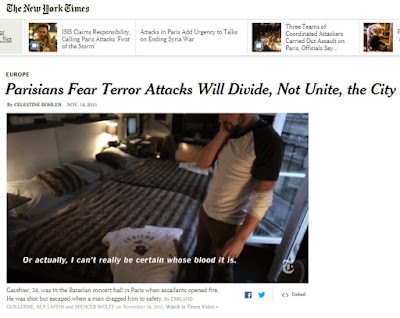 This Ongoing War: A Blog: 15-Nov-15: The real danger in post-massacre Paris? 15-Nov-15: The real danger in post-massacre Paris? According to a New York Times headline, it's that "Parisians Fear Terror Attacks Will Divide, Not Unite, the City"
Some people of immigrant background, who declined to give their names, worry that people will conflate France’s large Muslim population with radical Islam. at the very end of the 20-paragraph long, 876-word piece... in its second-to-last pararaph. Score one again for meme-hijacking-by-headline-editor. And what does she write in the very last para? Mr. Balet is not sure that solidarity was the reason so many stores and restaurants stayed shut today. “I think it is fear,” he said. We agree. Fear is definitely a subject worth exploring. Also the aspect of how, whoever is behind Friday's mass killings, might well be more encouraged, rather than less, to execute this kind of horrible attack again even bigger and better in the future.